Are You as Good Today as You’ll Ever Be? Will today be as good as your life ever gets? Let’s pretend I’m an all-knowing being – which I most certainly am not – and that I visited you with an announcement: today, you’re as good as you’ll ever be. You’ll never be any better than you are right now. Tomorrow won’t be terrible, but you will be a little less happy, a little less healthy, make somewhat less money, have shallower experiences and make a smaller impact. And that will continue each day for the rest of your life. Would you be happy hearing that? I am very confident that most people would say no. At some level, we all hope and expect our lives will keep getting better… but what do we do each day to ensure that happens? Ongoing improvement requires both desire and discipline. You need a passion and a plan. That’s why I wrote, The Potential Principle: A Proven System for Narrowing the Gap Between How Good You Are and How Good You Could Be. I’ve been fortunate to work with some of the best companies and highest performers of our day. I noticed that many had succeeded at becoming the best in their space, but once they did, they faced a greater challenge: how to become even better. When you’re at the top of your game, improvements are more incremental and harder fought. You have few exemplars, if any, to emulate. You are the leader now, and just maintaining (not to mention increasing) that lead grows more and more difficult. If you are already among the best, why bother getting any better? First, consider this: We all know how good we’ve become, but none of us know who good we could be. No person or organization I’ve worked with has ever claimed they were living or doing business at peak potential. Why? We simply don’t know what is possible, so we keep aiming to get better and find out just how good we could be. That makes life and business incredibly interesting. There are also several practical factors driving the need to improve. The first is change: with so much change occurring around us, we need to improve our knowledge and skills just to keep up. The second is competition. If our competitors get better and we don’t, we lose ground. The third is customers. They have increasing expectations. Ever noticed that the more you do for customers, the more they expect? That’s why you need to continue to increase your value proposition. Finally, your capabilities are above whatever level you are performing at now. As a client once told me, we don’t benchmark against our competitors, we benchmark against our capabilities. Nobody gets better “accidentally.” Only wine improves with age without trying. You don’t accidentally improve significantly. And you can’t reach the highest summits of your potential or make the greatest positive impact without intentionality. How much do you want to get better? Teachers can teach you, coaches can coach you, and motivational speakers can pump you up but it is what you do with the information that matters. Ongoing improvement requires a process, and it’s based on correctly, consistently applied principles. The exciting thing is, when you take intentional action, the door to your future swings wide open. Your willingness to work at self-improvement is the secret to realizing your full potential. You supply the commitment to getting better, coupled with the right plan and process, and your effort will start to pay off. It’s well worth it. Not only will it benefit you, but it will also benefit the people around you. Your customers will be happier. Your boss will be impressed. And your family will see you at your best – the spouse and parent you really want to be. So, you have a choice to make. Are you content coasting along, content with the status quo? Or are you ready to make your best even better? You may not yet know just how good you can be. But I have a tool you can use to make sure you’re moving in the right direction. I call it the Potential Matrix. This grid identifies four aspects of life that are crucial to your journey toward improvement: the performing quadrant, the learning quadrant, the thinking quadrant, and the reflecting quadrant. Each represents potential areas of growth, and they all complement each other. Growth in one area can be used to foster growth in the others, leading to greater progress overall. How can you best use this Potential Matrix? Begin by deciding what you want to improve: a project, a performance, a relationship – anything that really matters to you. Then use all four quadrants to help you get there. One of the most common uses of the matrix (and the most helpful) is to start in the thinking quadrant. Determine what needs to be done and move into the learning quadrant to learn the needed skills. 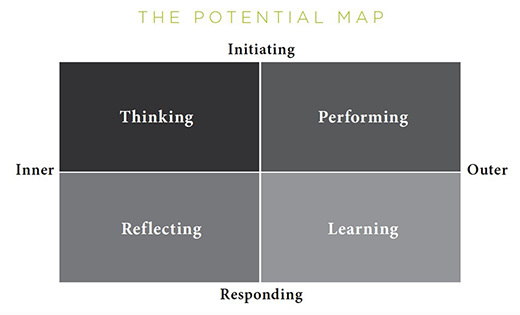 Then you apply those skills in the performing quadrant and afterwards reflect on the insights you gained. Then you can go back into the thinking quadrant to rethink for even more improvement. We all have one “preferred zone” where we are most comfortable and enjoy operating, often to the exclusion of the other zones. If you really want to be the best you can be, you’ll have to go exploring outside your comfort zone. It’s in those uncomfortable areas where you’ll grow the most. Maybe you’re more at home in the inner world of thoughts and ideas than in the outer world of words and action. That can be awesome, but there’s a danger that you might think a lot without doing much. Or maybe the opposite is true, and you like being highly productive. Again, that’s great, but you might be doing a lot without thinking much! This lesson is an important one: focus on improving within all four quadrants of the Potential Matrix. Your purpose is essential to pursuing your potential. If you want to be everything you can be, you need a compelling reason. That’s your purpose. It takes a strong why to power the what and the how of personal growth. D. L. Moody said that our greatest concern in life should be to succeed in something that really matters. One of the best ways to do this, and move closer to realizing your true potential, is this: Look for the inherent meaning in your work, and infuse your existing work with meaning. When you commit to something bigger than yourself, you’ll often find your bigger purpose. Remind yourself every day of how your role as an employee or an entrepreneur contributes to the purpose of your company, and of the impact you have on customers. When you make your best even better, you also have more to give your family and community. Remember that you have a positive impact on others through your performance. It isn’t just the job that you have but also how you do that job that makes the difference between average and extraordinary. Resolving a customer’s complaint gracefully, delivering a knockout sales presentation or going above and beyond as a parent or spouse gives purpose and meaning to your efforts. What matters most to you? What gets you out of bed each morning, excited and ready to face the new day? Where do you enjoy spending your time, energy and heart? As a person of faith, I believe we all have a purpose in life. Find yours. Discover the meaning in what you do. Then give it everything you’ve got, using the tips I’ve shared in this blog and the guidance and encouragement I offer in The Potential Principle. Not only will you find success in bettering your best, but your success will matter—both to yourself and to the people around you. Leadership expert Mark Sanborn is the author of eight books, including the 2004 best-seller The Fred Factor: How Passion in Your Work and Life Can Turn the Ordinary Into the Extraordinary and 2017’s The Potential Principle: A Proven System for Closing the Gap Between How Good You Are and How Good You Could Be. A member of the Speaker Hall of Fame, he is a winner of the Cavett Award, the National Speakers Association’s highest honor. Sanborn is also a member of the exclusive Speakers Roundtable, made up of 20 of the top speakers in America.